It is very important to pinpoint the exact cause of the failure of the Primary Total Knee Replacement Surgery. Thus it is very imperative to rule out infection by doing specific tests like CBC, ESR, C-Reactive protein and technetium followed by gallium scans. Current X-rays are compared to previous X-rays to see for any implant breakage, malalignment etc. Pre-operation preparation must always include preparation of bone graft donor site, which is usually the iliac crest. The exposure is the same as any Primary Total Knee Replacement Surgery, after which the original artificial joint is removed. If the primary artificial joint was put in with cement, the cement has to be removed from inside the canal of the femur and the tibia. Because the bone is often fragile and the cement is hard, removing the cement can cause the femur or tibia to fracture during the operation. This is not unusual, and in most cases the surgeon will simply continue with the operation and fix the fracture as well. Samples of bone and marrow tissue are usually removed during the surgery and sent to a laboratory to see if any infection is present. If an infection is present, a new artificial joint will probably not be put in There is almost always a bone loss around the primary prosthesis (see below). The Orthopaedic Knee Surgeon deals with this problem by placing a bone graft or metal wedges (partial or complete) around the artificial joint to reinforce the bone. This bone graft may come from your own body, such as bone taken from the pelvis during the same operation or obtained from the bone bank. After application of bone and other materials to rebuild the tibia and/or femur, a new prosthesis is implanted. It is challenging to imitate the natural shape of the bones after rebuilding the bone, so a specially designed prosthesis is usually needed. All of this is carefully planned by the Orthopaedic Knee Surgeon before the operation. To get the best and sturdiest fit between the tibial and femoral components, the surgeon adjusts and balances the soft tissues that surround the knee joint. 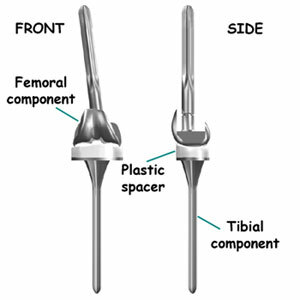 Further adjustment is made by changing to a thicker plastic portion of the tibial component. In the end, the surgeon tries to get the best fit so that the knee is stable through a full range of movement. When the tibial and femoral components are in place and the soft tissues have been balanced, the surgeon will address the patella. In some cases, the patella may not need to be revised, especially when the surgeon sees good fixation of the original patella implant. Rehabilitation is usually the same as that of the Primary Knee Surgery. The prosthesis used during revision total knee replacement surgery are very complex, with rods and wedges to compensate for bone loss.